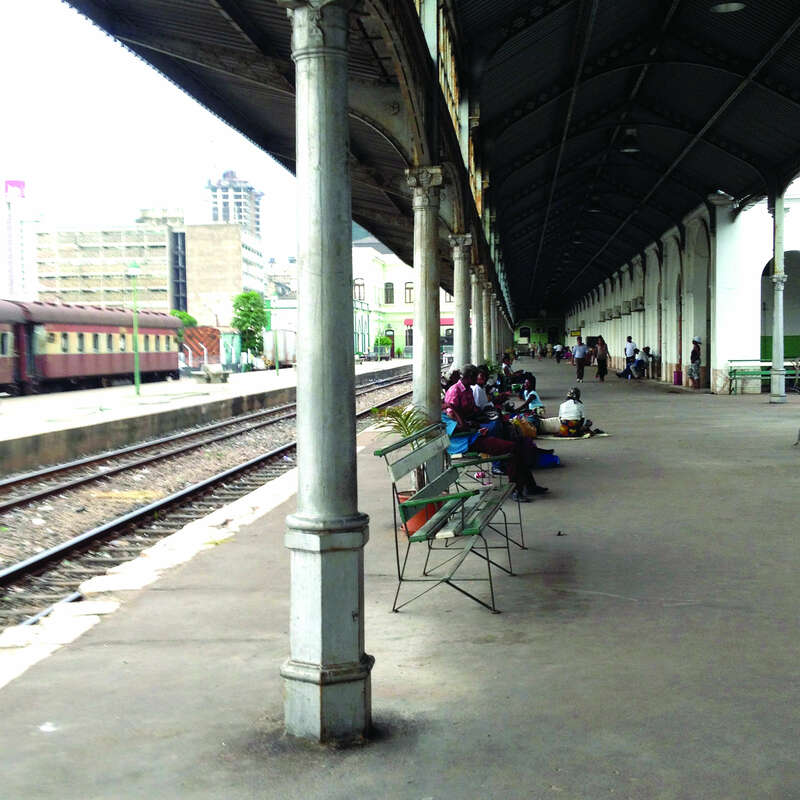 The Ministry of Transport and Communications of the Republic of Mozambique contracts Systematica for the development of an overall study on existing and potential extensions of Mozambican national railway network. The study has no precedent since Mozambique’s independence in 1975, and due to its complexity, requires the involvement of a number of professionals – planners, geographers, engineers, and economists – and academics. The scope of the work consists of: a) sector scan and opportunities assessment for Lubombo, Lichinga-Pemba and the new North-South Development Corridors, and; b) pre-feasibility study and business model for the new North-South railway line. The sector scan and opportunities assessment have the main objective to: assess the current situation in the catchment areas of each Development Corridor; identify on-going and planned anchor projects; identify main investment opportunities and relative clusters; identify the need of investment in transport infrastructure, and; set a list of priority projects up to pre-feasibility stage. The pre-feasibility and business model are complementary to new North-South railway line’ sector scan and are aimed at: assess existing travel demand; forecast future demands for set time-scenarios; develop a macro-simulation model of the proposed railway network; propose the most feasible alignment for the new railway line, and; verify technical and financial feasibility for the proposed alignment. Systematica, together with the appointed Consortium of professionals and academics, develops a portfolio of proposals for the three Development Corridors and a phase-based development for the new North-South rail line. All proposals are strictly intertwined with the agriculture and tourism sectors, since the overall objective of the assignment is to harmonize the major projects with potential investment agriculture, agro-industry, processing of natural resources, tourism, and services. Lubombo Development Corridor crosses the entire Maputo Province, linking the following districts: Boane, Maputo, Matutuine and Namaacha. 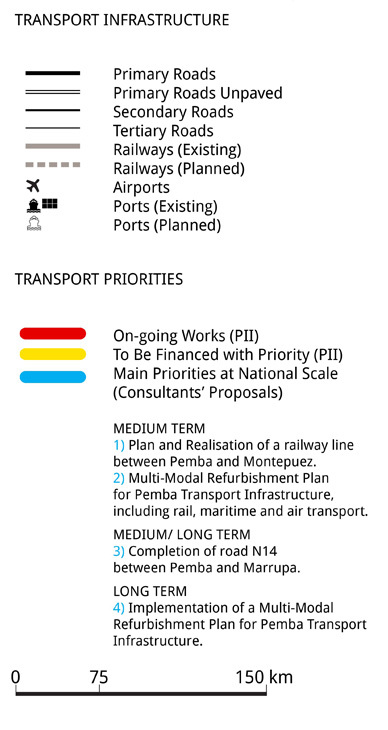 The proposal, resulting from the multi-sectoral sector scan includes: a new integrated agro-park to supply food existing and future demand in the most populated Mozambican provinces; two new touristic poles, and; the realization of e new rail-based transport infrastructure: LMR – Lubombo Metropolitan Railway. LMR runs between Maputo city centre and Bela Vista (with further extension up to the area of the “Port of Techobanine) and is conceived for both passengers and freight transportation. LMR project aims at mainly three scopes: 1) Systematize, by creating a network, the main centres of the Lubombo Development Corridor; 2) Improve the conditions of mobility of all the inhabitants of the area, by offering them a safe, comfortable transport system, to be used for various purposes by all the social groups, including the weakest ones that do not own a private vehicle, and; 3) Reduce the usage of private cars and improve the usage of shared and sustainable – like railway – modes of transport, helping also to better the quality of the Lubombo Development Corridor’s environment. Lichinga-Pemba Development Corridor crosses Cabo Delgado and Niassa Province. 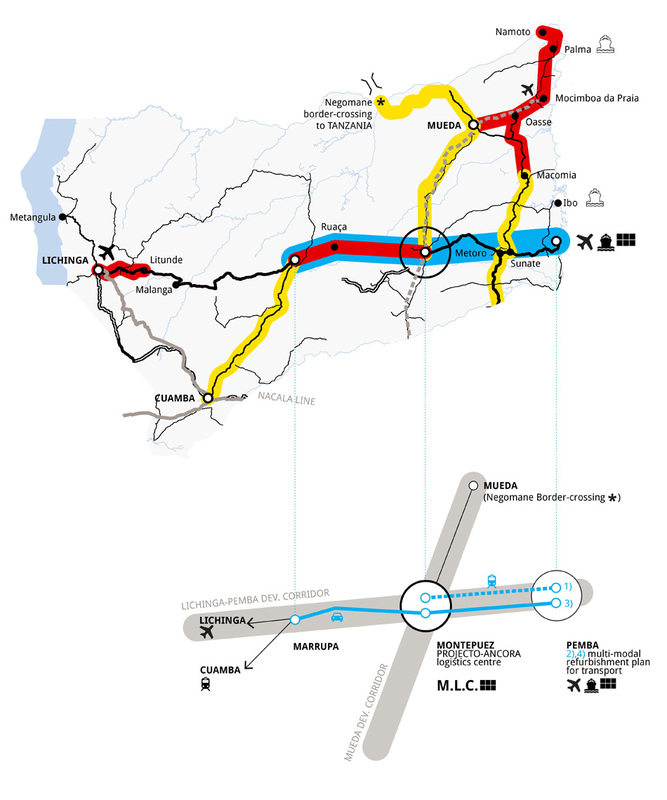 The proposal, resulting from the multi-sectoral sector scan includes: a refurbishment plan of existing transport infrastructure, defined in line with already on-going governmental Integrated Program of Investments, and; the realisation of a new pole of logistics: MLC – Montepuez Logistics Centre. MLC aims at the following main scopes: 1) Offer the regional, national and local production system the best solutions in terms of logistics, transport and storage activities; 2) Optimise the regional, national and local logistics chain; 3) Increase international trade exchanges through the close border-crossing in Negomane (Tanzania); 4) Supporting the local extracting industry’s goods distribution; 5) Control transport cost increase; 6) Enhance industrial productivity competitiveness; 7) Rationalise infrastructure in order to optimise area utilisation and safeguard the environment, moving the logistics-related heavy traffic away from the residential and most fragile areas. North-South Development Corridor. 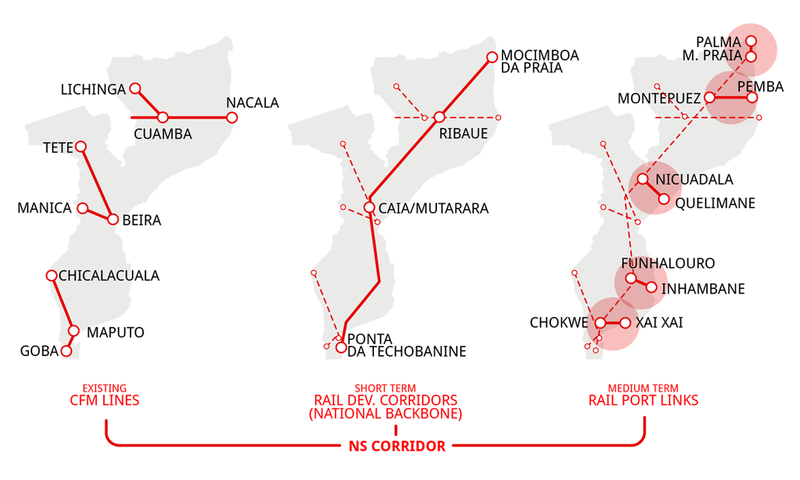 Currently Mozambican railway network is composed of three lines running in E-W direction that do not respond adequately the existing and potential demand nor act as connecting elements in a country which territory extends more in N-S direction. The proposal for a new N-S railway line is defined on the basis of the following three main assumptions: a) geographic barycentric position of the new railway line; b) strategic proximity to the coast of the new railway line, and; c) higher demand fruition of the new railway line. 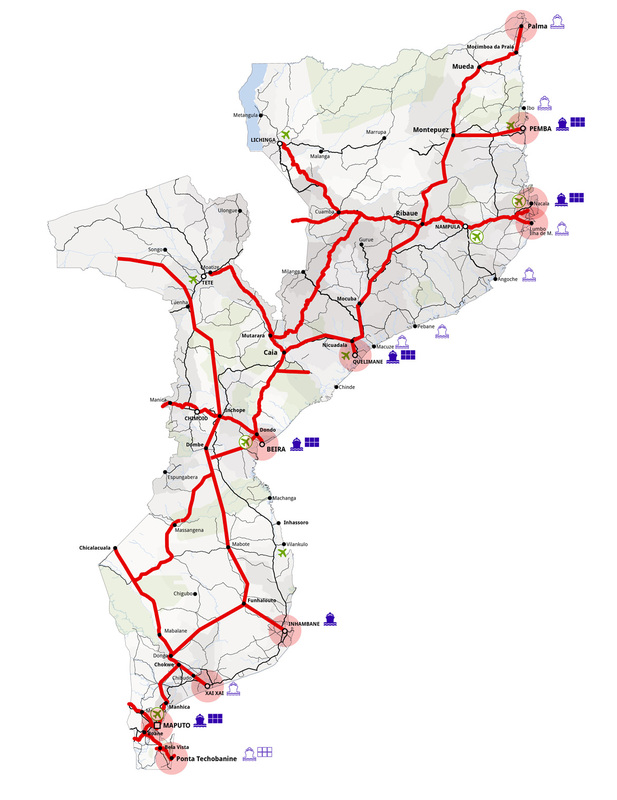 The proposed N-S Corridor runs for about 2,500 km, crossing and servicing all Mozambique. For its realization, a phase-based development is proposed: in the short-term all three existing E-W railway lines are connected each other through the new N-S railway backbone; in the medium-term all existing ports are connected to the new N-S railway backbone, with rail port links: this solution enhances the multi-modality of the entire transport network envisaged by Systematica. Finally, the proposal, resulting from the multi-sectoral sector scan foresees the creation of new agro-logistics chain infrastructure located along the N-S Corridor and served by the proposed railway network. The study has no precedent since Mozambique’s independence in 1975, involving all national territory and focusing on 3 of the major Mozambican Development Corridors.